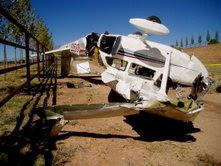 Lewis Jungle Ministries: A Faith Ministry: Plane Crash! We are finally ready to depart on our mission adventure to Venezuela. We have been preparing for this for a long time and after several delays, we are finally set to go. It is amazing how the Lord has led us to this point. The devil has been working extremely hard trying to discourage us with major financial set- backs and even tried to kill Gary last week. But when you are committed to serving the Master, these set- backs become His problem to deal with and He is able!! The book of Job has taken on a more personal meaning in the past few months. Job had no idea why he was going through his ordeal yet he trusted God and refused to "curse God and die". We know that the devil doesn't want us to go, but God has said, "Do you trust me; are you willing to follow me no matter what"? Our faith has faltered at times, but it has grown as we keep reminding ourselves that God is still on His throne and still in control!! Praise the Lord!! I was finishing up my night flying requirements in Prescott in August, on a very dark night flight over desolate areas of Arizona. We were trying to find a time to fly in between the monsoons. We discovered the next day that a value had stuck and we were flying on 3 of the 4 cylinders and didn't know it. Oh the love of God! That is why we always ask the Lord to fly with us, but didn't realize at the time that the angels were working overtime so that we didn't have to land in the middle of nowhere that night. We had a buyer come the next day for the plane, but he backed out when we found an oil leak, and discovered that we would have to have it overhauled. That was an expense and delay that we didn't plan on. But knowing that the angels fly with us is a tremendous strength. Last week, I went to Prescott to do some flying in our plane, since I had some extra time and still needed more hours. I needed to finish my check ride for my commercial rating, also. It was the first time that I had flown the plane since it had been overhauled. The maintenance shop had flown it to Phoenix for me to pick up there. On Wednesday morning, Oct. 10, I took off from there, heading to Prescott. 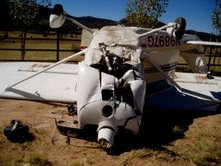 When I was northwest of Prescott, the engine suddenly lost power and made lots of noise. I radioed the airport and told them of the problem, but I was still 8.5 miles away. I tried everything I could think of to bring the engine back to life, without success. The wind was gusting a lot. I had to set it down in a rural area NW of town. Unfortunately, I lost altitude too fast and it bounced and flipped. A passerby helped me get out of my seat where I was hanging upside down. I have no memory of the crash or getting out. I was life-flighted to Flagstaff Medical Center. After CAT and MRI scans, no broken bones or long term damage was found. Praise the Lord!! After seeing pictures and talking to those who saw the wreck, they can't believe I'm still alive, let alone was able to walk away. My angel was working very hard to spare my life that day. I was in the hospital only 24 hours. Toni flew out to help me, and we had a car to drive around, thanks to my sisters. Our friends in Prescott and Phoenix were a tremendous help, in many ways. I have a lot of soreness and stiffness yet, but am very grateful the outcome was as good as it is. Monday morning, Oct 22, we leave for Venezuela. Things aren't looking too good right now in that country for doing medical aviation or gospel flying. But God is still in control. If He wants us there, He will provide a way to do it. If that door closes, there are several other countries where we can go to serve in the same way. We just are trusting that the Lord will lead us day by day to accomplish His will.We want to thank those of you who have been praying for us. Prayer is a powerful tool against the fight with the devil –"for we fight not against flesh and blood but higher powers". Those who have supported us with your time, your homes, help and donations have been greatly appreciated too. Thank you so much! God is in charge, Gary,keep up the good work.